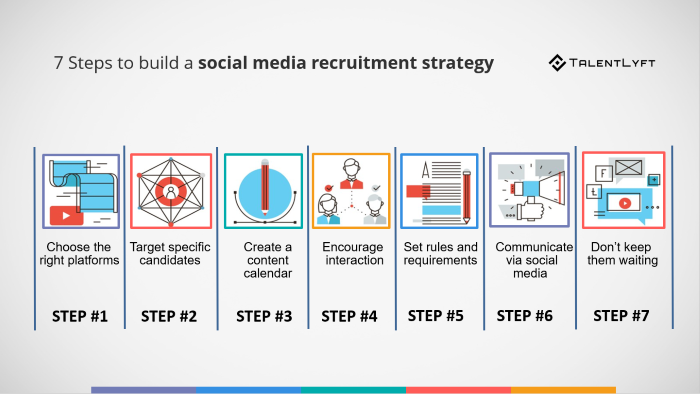 We broke down the complicated process of building a social media recruitment strategy into 7 easy to follow steps. In this blog post, you will learn how to choose the right social media platform, target the right candidates and successfully communicate with them via social media channels. Social media platforms continue to dominate the web as leading communication channels. Sites such as Facebook, Twitter and Instagram count users in the billions, making it clear for companies that they should be more attentive of them. Do you really need a social media recruitment strategy? One of the more popular and useful activities which you can employ via social media is the act of candidate recruitment. 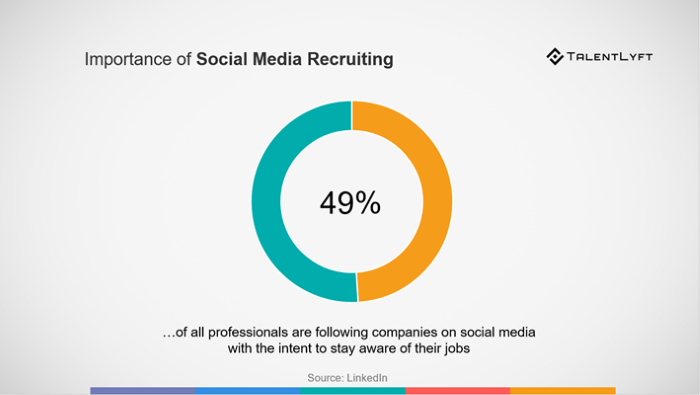 Using social media in recruitment is known as social recruiting. Social recruiting is one of the most productive recruitment marketing strategies. Download the List of most productive Recruitment Marketing strategies that will help you attract and hire the best talent! Studies show that job candidates prefer using social media as a means of looking for work more than any other method. According to a recent LinkedIn survey, half of all professionals are following companies on social media with the intent to stay aware of their jobs. Every company has openings available for one reason or another – including your own. What better way to fill the proverbial void than by using social media to promote your employer brand? In this blog post, we’ll take a look at several steps which can help you attract relevant candidates and hire quality talent in no time whatsoever. How to build a social media recruitment strategy? Social media platforms fall into several different categories. Some are used by casual internet users as a means to communicate with their friends and loved ones. Others prefer using social media as a means for B2B networking, company blogging and other activities. Choosing the right platform for your specific industry and job description is highly important. For example, you can look for a content manager through Facebook, but you are far more likely to find a talented individual via LinkedIn. The same rule applies to the type of content you are about to publish. Blog posts work far better on LinkedIn than on Twitter or Instagram. Define your expectations and make sure to choose one (or several) platforms that cater to your specific industry trends. Searching for a job candidate isn’t as simple as it seems. You can have the best possible job advertisement but if you fail to target the right market – no one will apply for it. Make sure that you are clear about the type of people you want to attract to your company. Do you want to attract fresh graduates, established professionals or something in between? Do you have special job requirements such as a certain work ethics, background, family status and other characteristics? These are important questions that can help you better determine which candidates your brand really needs. You can avoid a lot of downtime by simply creating a candidate persona and centering your entire recruitment campaign on it. It will make unfit candidates pass on the application while encouraging others to send their resumes and motivation letters. Attracting high-quality candidates is all about being consistent and persistent. Make sure that you are ready to create recruitment content for several weeks in advance. You can automate said content through social media by scheduling it. It will automatically post based on your custom requirements and ensure that you can focus on data evaluation and further content creation. A content calendar will make it easier for people to see your job opening advertisement and react to it. The more often you post, the better your chances are at being spotted. Make sure not to overdo it, however – social media platforms work much in the same way SEO does. Too much content (even good content) can put you on the blacklist of spam businesses. Calls to action (CTA) play a huge role in social media recruitment. While it is true that candidates look for work and naturally respond to interesting posts, you need to ensure that it actually happens. Include motivational, moving messages in your job advertisement. Things like “sign up today – change your tomorrow” and similar should be included in your social media posts. They are easy to digest and make it interesting for social media users to consider and eventually apply for work. If you are looking for digital nomads or freelancers, you might consider localizing your content for extra measure. Check out the largest translation companies on the web and see if you can find help from a professional translator to do it. After all, chances are that you don’t have Spanish, Chinese or Russian native speakers (to name a few) already on the payroll. As far as job descriptions go, you should be aware of any and all details concerning it. This means that you should define the entire application process to the letter before posting anything. A social media recruitment strategy is not unlike traditional HR recruitment when it comes to rules and requirements. Set strict formatting, documentation and resume rules for your candidates. Don’t rely on improvisation and don’t expect every application that comes your way. Those that don’t follow your rules are likely to continue doing the same if you accept them. Make sure that you are seen as professional and that you expect nothing less from potential colleagues. The nature of social media channels dictates direct communication. Your social media pages can easily serve as backdoor customer support for any potential candidates. People are likely to ask for additional information about the placement, the company itself or the recruitment process. Instruct your social media managers to answer any and all questions in regards to the job opening. Don’t ignore these messages since they will reflect badly on your social media ranking and overall visibility. Sites such as Facebook and Twitter prefer to display pages that frequently answer private messages as opposed to the ones that don’t. Be a part of the former and show some good will by answering even the marginally-related questions. Social media platforms encourage fast response times and quick turnaround of information. Follow this logic if you plan on using social media recruitment. Once the applications start coming in, make sure that you get back to the candidates as soon as possible. If nothing else, create an automated response message which will ensure great candidate experience. Your company can get a lot of bad reputation by ignoring direct messages, especially if it’s something as important as job placement. Whoever sent you their resumes is in dire need of employment. Show them the respect they deserve by responding with additional questions or an interview appointment as soon as you can in order to avoid bad candidate experience. Once you establish your brand as a social media recruitment reliant, people will be eager to see more openings. Teach your social media followers to be on the lookout for potential employment by paying close attention to your posts. You will gradually create an organic follower base which you can use to promote not only your openings but products and other related news as well.